All the usual MFD functions at an entry level price and low running costs, Epson Stylus SX535WD seems to be a great option going purely by the specifications. Epson Stylus SX535WD comes with a maximum print resolution of 5760 x 1440 dpi, and the output it gives, is of good quality. The print speeds are claimed as 36 ppm for both mono and colour prints, which works only on a light draft prints. Heavier and image prints take much more with speeds dropping to 3 ppm. The Epson Stylus SX535WD ink cartridges also come in high yield variety which help to lower printing costs. The scanner has a resolution of 2400 x 2400 dpi, and gives good outputs. As there is no automatic document feeder, multi page scans have to done one by one, which can be cumbersome if such scans are a regular affair. The printer is slightly bulky in dimensions but light weight otherwise. It supports a huge range of connectivity options from USB, ethernet, WiFi to most types of memory cards. The input tray supports upto 150 A4 sized pages. The 6.3 cm LCD along with front panel buttons, do a lot in terms of functionality. Duplex printing, connectivity options at a low price point are an add on. Epson proprietary Easy Photo Print software helps to enhance the quality of photo printouts. There are many functions in this printer which are not commonly available in entry level devices. It's easy to use and gives high quality outputs. Overall, a good option for home and small offices. What to do when the printer start producing blank prints? The major reason for such issue in an Epson Stylus SX535WD printer is the clogged print heads or dried out Epson Stylus SX535WD ink cartridges. If you are using your printer after a long time it is possible that the ink cartridges have dried out. If that’s the case we suggest you replace the cartridges first before proceeding further. In case, you have recently replaced the Epson Stylus SX535WD ink cartridges then it must be the blocked print heads. To resolve the issue you would need to run a few printhead cleaning processes on your printer. Once the printer is done cleaning the printhead, it will produce a nozzle check pattern. Check this pattern to confirm if it has fine print and no missing lines or dots. Note that you would have to run the cycle more than a few times before getting the issue resolved. Each staggered horizontal and straight vertical line should be complete, with no gaps in the dot pattern. After four or 5 cycle you can also try turning the printer off for overnight this allows any dried ink to soften. Try one more printhead cleaning cycle the next day and then try printing again. If none of these things help, your printer may require service and you should contact Epson technical support for further assistance. Q. I do not have a WiFi connection. Can I print documents using ethernet connection, if I use Epson Stylus SX535WD printer for printing purpose? A. Yes, definitely. Apart from WiFi printing, the printer also supports ethernet connectivity and includes memory card reader at the front to serve your printing purpose. Q. What are the compatible ink cartridges for replacing Epson Stylus SX535WD ink cartridges? Epson T1294 Yellow ink cartridge. Q. What is the ink volume of compatible Epson Stylus SX535WD ink cartridges you sell? A. The ink volume for compatible Epson Stylus SX535WD ink cartridges is 15ml for black and 13ml for coloured (Cyan, Magenta, Yellow) ink cartridges. Q.How can I rate the Epson Stylus SX535WD ink cartridges purchased from your site? A. To rate the product or to add your review for the purchase made, select the ink cartridges you’ve bought from the site. You will see an option of “Add Review” given below on the product page. Proceeding to this option, you can write your own experience, this will help others making a right choice. A. The printer is compatible with MS Windows XP, MS Windows 7, MS Windows Vista, MS Windows XP 64-bit Edition and Apple Mac OS X 10.4. Q. What media sizes are supported by Epson Stylus SX535WD printer? A. The media sizes supported by this printer are 100 x 150 mm, 130 x 180 mm, 130 x 200 mm, 90 x 130 mm, A4 (210 x 297 mm), A5 (148 x 210 mm), A6 (105 x 148 mm), ANSI A (Letter) (216 x 279 mm), B5 (176 x 250 mm) and Legal (216 x 356 mm). Q. It appears like the printer is printing. But when I try to print it's giving me blank pages. I tried printing after cleaning the printhead for several times but there's no improvement. Would you please help? I am using Epson Stylus SX535WD model. A. We are happy to help. At the outset, it is always recommended to clean the print head for 2 to 3 times to resolve such issues. But as you said that you've already tried that trick the only option left is replacement of the existing Epson Stylus SX535WD ink cartridges with the new ones. Or perhaps, you could leave the printer turned off for overnight and try printing the next day. With this the ink will get time to soften if it has dried and then you can clean print head again and start printing. If you find no improvement then your printer requires service. Please contact Epson customer support or check with your nearest Epson dealer for further assistance. Q. How do I monitor the ink levels on my Epson Stylus SX535WD printer? A. You require installation of Epson Status Monitor utility which is available on the CD ROM of Epson printer software. The CD ROM is provided along with the purchase of the printer. You need to insert the CD ROM to start the procedure. For complete details on how monitor the ink levels for the printer please visit Epson support website. Q. Epson Stylus SX535WD ink cartridges can sustain refilling for how many times? A. Refilling of ink cartridges depends on the practicability of the ink cartridge. Many ink cartridges can be refilled for about 3 to 4 times. And, there are instances when the ink cartridges are refilled for more than 10 times. You need to keep your Epson Stylus SX535WD ink cartridges in a good reusable condition so that it can be refilled several times. Q. I’m planning to give compatible ink cartridges a try for my Epson printer the next time around. Will compatible Epson Stylus SX535WD ink cartridges really give the same number of pages and cut cost considerably? A. Yes, definitely. Compatible ink cartridges are made by a third party company, but they are brand new and cost far lesser than the original ink cartridges. Compatible ink cartridges in fact print more pages than genuine cartridges do, which means you actually save up a huge amount of printing money. Q. I’d like to know if Epson Stylus SX535WD ink cartridges have been made from high quality materials. A. These ink cartridges have been manufactured from premium quality materials. Specially formulated dyes have also been used in manufacturing these ink cartridges. Q. I need to carry out head cleaning for three Epson Stylus SX535WD printers that I use for my business. Will it be a very expensive process? Please help. A. The process of cleaning the printer head requires ink, and since you have to clean the printer heads of not one but three printers, you need to be ready accordingly. Q. Is the capacity of the black ink cartridge the same as that of colour cartridges in Epson Stylus SX535WD ink cartridges (T1295)? A. The capacity of the black ink cartridge in the Epson T1295 ink cartridges is 11.2ml, while each of the three colour cartridges (cyan, magenta and yellow) contains 7ml of ink. Q. What are the advantages of dye based ink that Epson uses in its ink cartridges? A. Dye based ink is ideal for printing photos and images as it sinks into the page smoothly, which allows colours to merge smoothly that makes them look vividly rich and sharp. Q. How many pages does the Epson Stylus SX535WD printer print in both, black and colour? A. This Epson printer prints around 380 pages in black and 440 pages in colour. Q. Is the shelf life of Epson Stylus SX535WD ink cartridges more than a year? A. These ink cartridges are known to last for up to a year. Q. Are Epson Stylus SX535WD ink cartridges available in high capacity units? Why are they often considered as a preferred choice by many? A. T1295 ink cartridges are available in high capacity units (1,700 pages) . High capacity units cut printing costs significantly while providing top quality output, so they are becoming a preferred choice for more and more customers. Q. 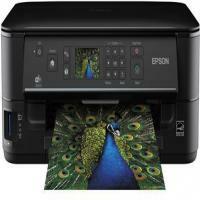 Is the Epson Stylus SX535WD printer a digital wireless printer? Can it handle text and photographic prints efficiently? A. Yes, the Epson Stylus SX535WD printer is a digital wireless printer that prints, scans and copies proficiently through Wi-Fi. It is also able to handle text and photographic prints and create both in what is termed high quality. Q. Is the Epson Stylus SX535WD printer able to create double sided copies? A. Yes, this printer can create double sided copies in very less time. A. The process of cleaning the printer head requires ink, and since you have to clean printer heads of not one but three printers, you need to be ready accordingly. Q. The quality of printouts that I’m getting from Epson Stylus SX535WD printer has deteriorated considerably even though I have cleaned the printer head a number of times. What should I do? A. One or more of your printer’s ink cartridges may be old or damaged. Please replace them soon to continue with your work smoothly. Q. Can I count on Epson Stylus SX535WD printer to print documents and images from PC tablets and smartphones? A. Yes, you can use the Epson Stylus SX535WD printer to print good quality documents and images from devices such as smart phones, PC tablets, etc. Q. The nozzle check of my Epson Stylus SX535WD printer is not working completely. Does it mean that I should replace the ink cartridges? Please advise. A. Before replacing the ink cartridges, carry out the head cleaning operation. If it does not solve the problem, only then you’d need to replace the ink cartridges.